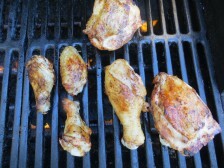 Michel writes: What am I missing with barbecued chicken? It’s always been my favorite, but every time I grill it, I burn it and not from not lack of attention. Should I just bake it? I’m thinking the oven might be the way to go. Agreed? Tony’s take: Happy days….first grill question of the season! And make no mistake, Michel, this is a grill question. 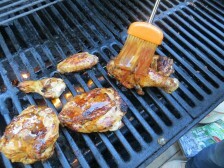 Baking bbq chicken is, at best, a compromise: no smoke, no fire, no fun. Yes, grilling bbq chicken can go wrong, but it goes wrong for the same reason folks burn campfire marshmallows or roll solo through HOV lanes or wear shorts in April in New England: not enough discipline (or a plan, as it were). And here’s the thing: a simple method can get you there. Just divide the technique into two stages: first, grill the chicken sauce-free until cooked through and crisp (but most definitely not burnt); then, finish grilling the chicken with a couple of minutes of controlled basting to achieve the desired glazy/gooey crust, but still without crossing into charred or burnt territory. Go to the grill with this plan (and a quick, but intensely flavored homemade bbq sauce), and you’ll forever solve your bbq chicken conundrum. The technique: I like chicken parts for grilling, preferably from a whole bird so you get a nice mix of white and dark meat (after cutting it up). The bones help maintain moisture and the skin offers crisp possibilities. Break the whole bird down into 10 even pieces, then hit it with a double dose of flavorings: a spice rub to start and a quick bbq sauce/glaze to finish. Grill the spice-rubbed chicken over a moderate fire, flipping often, until it browns and cooks through. Then start basting with the sauce and flipping until it, too, browns and caramelizes. Serve with vegetables or something else kinda good for you and start stretching for a summer full of grilling. 1. 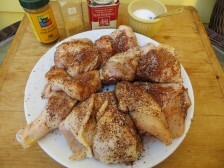 Prep and spice rub the chicken: Cut a whole chicken (4 lb.) into 10 pieces (or buy 3 lb. chicken parts). Rinse well and then pat dry. In a small bowl, mix 2 tsp. kosher salt, 1 tsp. chili powder, 1 tsp. paprika, 1 tsp. black pepper, 1 tsp. sugar, 1/2 tsp. pimenton de la Vera (or chipotle powder), and 1/4 tsp. garlic powder. Sprinkle all over the chicken along with 1 Tbs. olive oil and then marinate the chicken for up to 2 days (in the refrigerator) or let sit at room temperature while the grill heats. 2. 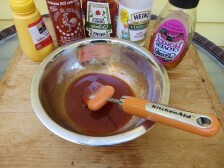 Make the glaze: In a medium bowl, whisk together 1/2 cup honey, 2 Tbs. ketchup, 1 Tbs. cider vinegar, 1 Tbs. Dijon mustard, 2 tsp. Sriracha, and 1 tsp. Worcestershire. Reserve or refrigerate for up to 1 week. 3. Grill: Heat a gas grill to medium or prepare a medium-hot charcoal fire. Rub the grill grates with oil. Grill the chicken, covered on a gas grill or uncovered over a charcoal fire, flipping every couple of minutes, until browned and crisp and completely cooked through, about 20 min. 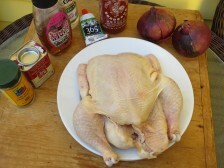 ; cut into a thicker piece or check that the chicken hits 165F on an instant-read thermometer. If there are flare-ups, move the chicken to another part of the fire. If the chicken begins to burn, reduce the heat to medium or transfer to a cooler zone. 4. 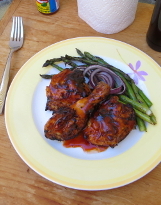 Glaze and serve: Brush both sides of the chicken with the bbq sauce and cook, flipping, until the sauce browns all over and caramelizes, 2 to 3 minutes. Serve immediately.